The Treasury of the Government of the Isle of Man have issued (19th November) their latest Christmas coin, a tradition begun in 1980 with the release of the first Christmas celebration 50 pence coin – now in its 33rd consecutive year. The design of this always-anticipated and eagerly collected festive coin draws from the spirit of the holiday season often reflecting winter scenes, references of Dickens and the Victorian era and the story of the traditional aspect of the celebration, this one of the most important days in the Christian calendar. The design for 2012 has as its inspiration, the story of the nativity and that of the Birth of Jesus. The story begins with an Angel of the Lord appearing to Mary to tell her that she will give birth to the son of God. Following the birth of Jesus an Angel of the Lord also appeared to some shepherds to inform them of the birth of this child. After the departure of the Wise Men, an Angel then appeared to Joseph in a dream warning that King Herod would seek to destroy the child and that they should flee Egypt. It is this Angel who played such an essential role in the Nativity Story that is portrayed on this year’s coin. Depicted on the reverse is a winged angel draped in a flowing gown and gesturing as though looking to guide the travels of the three wise men or to point to the location of the Christ-child. Placed in three spots, are crystal-like snowflakes of varying sizes. 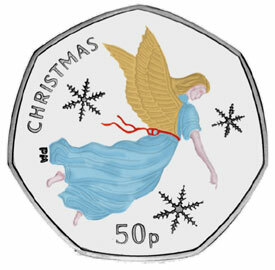 Along the upper left rim is the word “CHRISTMAS” with the coin’s denomination of “50 p” placed just below the principal design. The obverse includes the current circulation effigy of HM Queen Elizabeth II as designed by Ian Rank-Broadley, the year of issue “2012” is just below the Queen’s portrait. The distinctive seven-sided coin is struck by the Pobjoy Mint, UK and will be issued in five separate choices of strike. A 22 carat proof version, a sterling silver and a cupro-nickel proof version – the last two versions are also available in a vibrant colorized edition. The gold coin has a weight of 8 grams and a diameter of 27.3 mm. A mintage of 250 examples are authorized. The sterling silver version also has a weight of 8 grams and a diameter of 27.3 mm. A mintage of 5000 examples are authorized. The silver version is included in a Christmas Greeting card. For more information on this seasonal offering, please visit the website of the Pobjoy Mint at: http://www.pobjoy.com/ukworld/page.php?xPage=index.html International orders fulfilled.